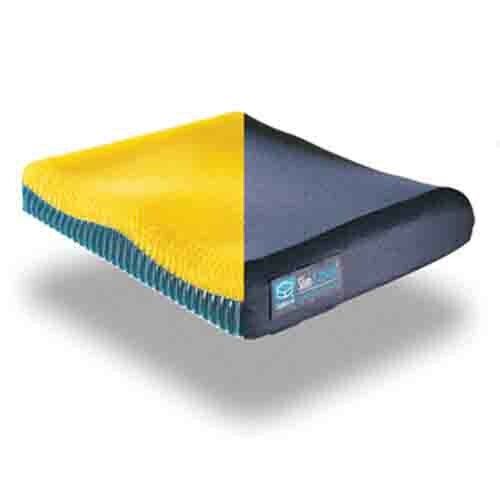 Stimulite Slimline Cushion, manufactured by Supracor, is an excellent seat cushion for active individuals who are at a lower risk for decubitus ulcers, more commonly known as pressure sores or bed sores. In fact, the Stimulite Slimline Cushion is great at preventing decubitus ulcers, too, as this Supracor seat cushion features a low profile, ventilated 2.75-inch thick, double-layered cushion and weighs in at a mere 3 pounds. Additionally, the Stimulite Slimline Cushion differs from other seat cushions by integrating abductors, an abductor, and a rear dish that develops a sophisticated contour for optimal comfort, support and stability. As with all Supracor cushions, the Stimulite Slimline Cushion is machine washable. To effectively and efficiently mitigate discomfort and prevent decubitus ulcers, pressure sores, or bed sores, order this long-lasting, yet comfortable and supportive cushion today! Product Numbers: SM1416, SM1616, SM1618, SM1816, SM1818, SM1820, SM2016, SM2018, SM2020. Application: To mitigate pain from pressure sores, decubitus ulcers, and bed sores.